The Dream Center is a community resource center in northwest Springfield, an area of the highest poverty and greatest need of assistance. Resources include a food pantry, clothes closet, a free after-school program for area children, high school equivalency classes to assist those attempting to get their GED, a community dinner every Wednesday evening, a host site for the local Circles Program that teaches financial literacy classes and provides mentors for the families, and parenting classes, to only mention a few. The Rotary Club of Springfield North has partnered with the Dream Center on several projects to enhance the delivery of those services to the community. The most recent project was to provide much-needed video equipment for the Circles education center. Prior to this project, they did not have the equipment needed to show financial educational videos as part of their financial education classes. The equipment provided was a 65-inch “smart” television, a laptop computer, a Blu-ray DVD player, an Apple TV that allows wireless connection between the laptop and television, a sound bar to enhance the audio, two dry-erase boards, a wireless mouse, pointer, and all the required cables. Only time will tell the number of individuals and families whose lives will be improved through the enhanced educational opportunities provided by this equipment. 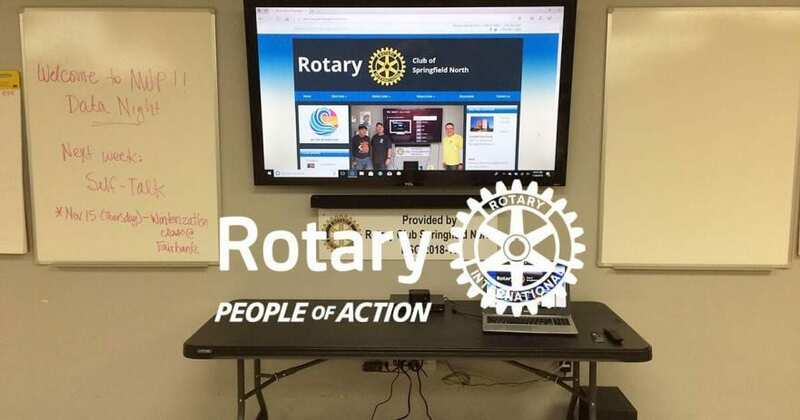 A portion of the funding for this project came from a District Simplified Grant from Rotary District 6080 with matching funds from the Rotary North Club. This is just one project out of several dozen Rotary projects to improve lives throughout southwest Missouri.